Contributor: 2JupitersTooMany. Unlike sports like basketball, or even hockey in Texas, the sport of Mixed Martial Arts used to be illegal. That means that at least a handful of proud supporters spent some time ducking from shadow to shadow to support the sport when it was a bit sexier and unsavory. Of course, it wasn’t called Mixed Martial Arts back then. It was Pankration, or the Gracie Challenge, or No-Holds-Barred or just something along the lines of Come To My Garage and We’ll Beat the Hell Out of Larry. But, eventually, along came the UFC. Jeff Blatnick, a champion Greco-Roman wrestler, and commentator for the UFC from 1994 to 2001, claims that he coined the term Mixed Martial Arts.1 Assuming that’s true, the timing is unclear to me. It may be that the term surfaced about the time that the UFC did. But for purposes of this little e-treatise, the timing isn’t important. What is important is that the phrase has come to represent the sport itself. And for years, insiders have been “training Mixed Martial Arts”, “performing Mixed Martial Arts”, and “competing in Mixed Martial Arts”. So what’s all this modern business about training UFC? As the sport has exploded in recent years, a large group of fans who never had to duck from shadow to shadow to support the sport are suddenly defining it in terms of the existence of an organization rather than the sport itself. Is that appropriate? Is it even grammatically correct to speak that way? I think it is. And here is why. 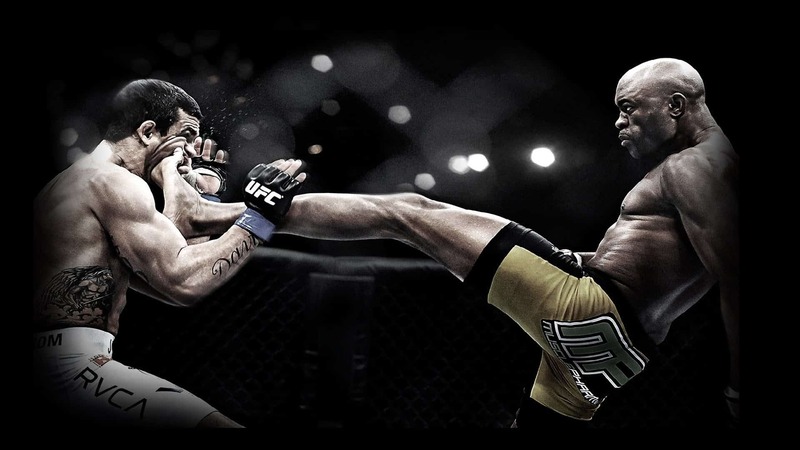 Mixed Martial Arts continues to be a relevant identifier of a group of disciplines. But it wasn’t always that way. It presumably wasn’t until Jeff Blatnick was barking into a mic around the time of UFC 4. A lot has changed since then. The UFC has come to represent, for most fans, the most stable, money-plump, all-defining representative of Mixed Martial Arts. So if Mr. Blatnick, presumably just over a decade ago, could slap a label on the sport, what’s so wrong with referring to it as ultimate fighting? It’s the ultimate expression of competitive fighting, isn’t it? But most importantly, is it inconceivable that a person could train UFC? Considering that the goal of most rising fighters is to fight in the UFC, under rules adopted by the UFC, and under the sizzle of a modern cultural limelight that has primarily been cast by the UFC, aren’t modern participants generally training with an eye on having their experiences defined to a significant degree by the organization itself? If I lost you there, consider this. Mixed Martial Arts has always been representative of a group of arts, and not a particular art itself. The phrase represents an idea that is larger than any particular discipline, or even a handful of disciplines. Now if it isn’t appropriate to speak about training “UFC”, then how can it be appropriate to speak of training Mixed Martial Arts? Shouldn’t a fellow limit himself to speaking of training Jiu Jitsu or Muay Thai or, God forbid, rubber guard? But we don’t do that. We want that term or phrase to grab onto to act as an expression of the sport as a whole. And just as Mixed Martial Arts represents a mass of ideas, ranging from a collection of disciplines, to at least a bare set of rules, the term UFC has come to represent the sport as experienced under the clay-shaping hands of the Fertittas and the Baldfather. Here’s my conclusion. The world of combat sports owes its present existence to men and women who worked like sun-starved Morlocks during the developmental years of fighting that didn’t involve ten ounce gloves. They have a right to be territorial, and if they find a term to be representative of the sport, or even purely nostalgic, it’s understandable that they would chafe at an influx of unconventional fans who don’t appreciate their vocabulary. But here it is: the sport has passed from infancy, into adolescence and on to adulthood. It doesn’t look the same anymore. The sport is walking on its own now, and as sad as it might be, it’s got to squeeze into new clothes now and then. And so, proud parents as some fans are, they might as well get used to watching and training and performing UFC. Mixed Martial Arts, UFC, it’s still rock n’ roll to me. 1 SLATTERY, HOLDEN (October 23, 2008). “Speaker tells Homer students to keep improving”. Cortland Standard. http://cortlandstandard.net/articles/10232008n.html.